The right combination of Bin Tippers, Hoppers, and Bins improves material handling for everything from grains to compost. Bins contain and transport bulk materials, Bin Tippers effortlessly lift and empty those Bins, and Hoppers safely channel the load into production lines, sorting tables, or any other intended destination. Bin Tippers use a unique lift-and-tip motion that sets them apart from other dumping equipment. These units keep the load-weight centered over the frame throughout the entire bin-emptying process for unmatched stability during use. At the same time, most models are highly portable and outfitted with rugged casters, ideal for production floors that do not allow forklifts. In addition to this unique dumping equipment, BHS offers a full line of Hoppers and Bins to create complete material handling solutions. Heavy-duty Bins from BHS are designed for high-capacity industrial use and manufactured for extreme durability. Ergonomic dumpers for trash cans and high-capacity containers. Industrial-scale storage and handling for bulk materials or waste. Many users choose Bin Tippers as an ergonomic alternative to manually emptying trash cans, pairing them with Bins to improve waste handling from the source to the dumpster. This reduces the risk of musculoskeletal disorders among staff while boosting efficiency throughout the waste stream. But handling trash, recycling, and compost is far from the only application that benefits from this equipment. ManufacturingBin Tippers integrate neatly with existing production lines, creating an ideal solution for dumping raw materials into Hoppers. Heavy-duty Bins make ideal collection points for metal shavings, plastic fragments, or other byproducts of the manufacturing process. Food ProcessingThere are numerous stainless steel options in these product lines. Designed for easy sanitation, these models meet all FDA requirements for food-handling equipment. Transfer ingredients in bulk using Stainless Steel Food Service Bins and Bin Tippers. Health CareMedical waste carries particular handling and disposal challenges, but safety options for Bin Tippers keep the task virtually risk-free. The optional PET-G Operator Guard fully shields the user from Bins with transparent, unbreakable plastic. Choose an additional PET-G Cage for another layer of security. AgricultureLift trucks fitted with Forward Bin Tippers speed up harvests by allowing workers to pack fruits and vegetables directly into pallet bins. This is particularly helpful for crops that quickly lose quality if they aren’t processed quickly, such as wine grapes. Alcohol ProductionBin Tippers are not just used during grape harvests. They assist at later stages in the alcohol-production process, safely tipping mash, must, or other ingredients into different vats for fermentation. This list is far from comprehensive. In fact, Bin Tippers, Bins, and Hoppers provide valuable ergonomic and productivity benefits in any bulk-material-handling situation. Often, that does end up being waste management. 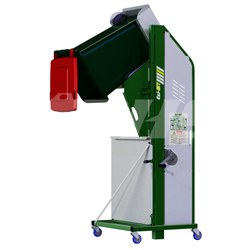 Every large-scale generator of waste can improve the disposal process with Bin Tippers and Bins. This includes schools, housing facilities, hotels, entertainment venues; the list goes on. Paired with a Mobile Garbage Bin (MGB), Bin Tippers offer fully streamlined waste management while protecting staff from strains, sprains, and muscle tears associated with overexertion. 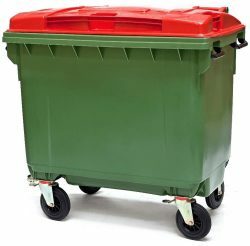 These heavy-duty plastic bins roll easily on sizeable casters, and large-grip handles ensure comfortable travel, even when filled to the MGB’s considerable capacity. To learn more about Bin Tippers, Hoppers, and Bins from BHS, or to find your nearest dealer, call us at +1 314 423 2075.